The Weller MG100S Fume Extraction Unit purifies air at up to 2 workplaces. The MG100S uses a High Gasfilter volume and electronic filter control with filter alarm. MG100S also has variable speed settings and a minimized foot print. Weller MG100S has a voltage of 110V to 240V and a heating output of 100W. Weller T0053657299 Easy-Click Extraction Arm With Sloped Nozzle And Stop Valve. The U-100-1000-ESD Weller MG100S Fume Extraction Unit is one of thousands of quality tooling products available from MRO Tools. Please browse Weller Filtration Tools for tools similar to the U-100-1000-ESD Weller MG100S Fume Extraction Unit. 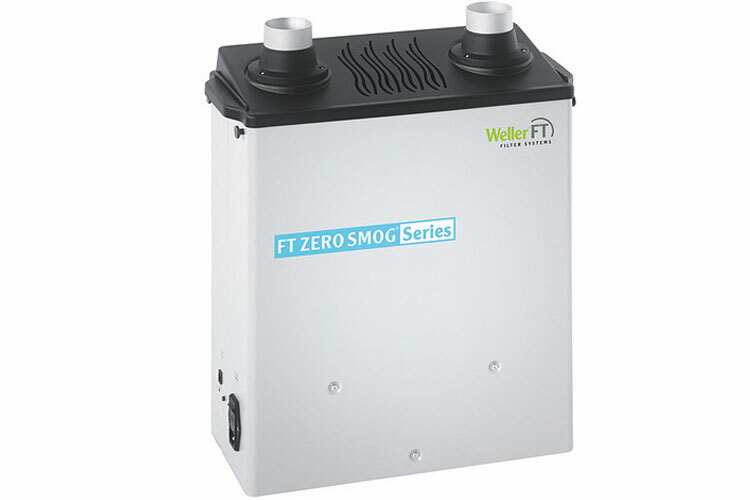 U-100-1000-ESD Weller MG100S Fume Extraction Unit description summary: Weller MG100S Fume Extraction Unit. Dimensions: 18.11'' x 8.26'' x 24.15'' (460mm x 210mm x 610mm) Weight: 15kg Voltage: 110V-240V Heating Output: 100W Quantity discounts may be available for the U-100-1000-ESD Weller MG100S Fume Extraction Unit. Please contact MRO Tools for details.